When we first launched the Growth Engine program in February 2015 , we set a target of training 1 million Europeans in critical digital skills. Within a year we’d reached our goal, and extended it to 2 million. Today, we’re delighted to announce that we’ve hit that target—we’ve now helped 2 million Europeans learn about and improve upon digital skills. That included people like Carlo Reviglio; now an intern at BikeSquare, a development company that works closely with the Italian tourism company Itaway, which helps tourists rent electric bikes. Carlo learned SEO and digital marketing skills through courses offered as part of Google’s Crescere in Digitale program, and was then selected for a traineeship run in partnership with the Italian Ministry of Labour in the framework of the EU Commission Youth Guarantee. That traineeship led to his internship with the BikeSquare team, where Carlo has worked to improve the platform’s performance, doubling in the number of e-bike rentals through Itaway in just a year. 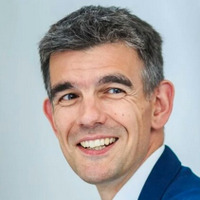 Carlo’s success is remarkable—but happily not entirely unique: He’s one of scores of Europeans trained in digital skills through Google programs. According to the European Commission, almost half the EU population (47 percent) is not properly digitally skilled, resulting in 700,000 unfilled jobs by 2020 because of this skills gap. Our programs across Europe have a goal of helping as many people as possible make the most of the digital opportunity brought by the Internet. We heard the call from the European Commission and others: we must all work together to fill this skills gap and so today we’re delighted to have this work recognised by Commissioner Günther Oettinger, EU Commissioner for Digital Economy. 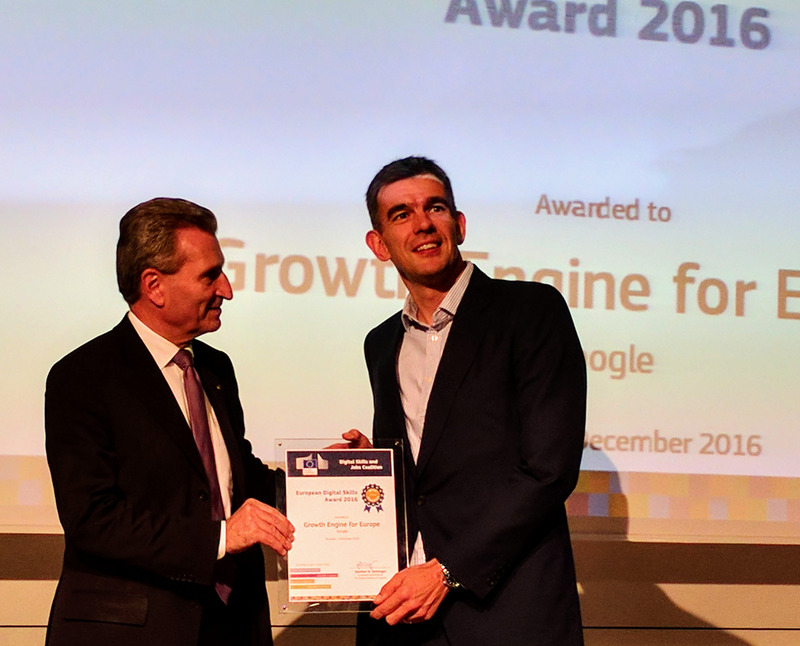 Today Commissioner Oettinger presented our Growth Engine program with an award for helping businesses and individuals succeed in digital. Our programs cater for everyone from entrepreneurs, to small businesses, to app developers and individuals. People of all ages, backgrounds and interests have taken part in our training programs. But there’s still more to be done, and so today we pledged to the EU Digital Skills and Jobs Coalition. Digital Workshop–our digital skills training program which provides free online and offline training training to anyone looking to gain essential digital marketing skills, including young job seekers, entrepreneurs and small businesses. Funding 10,000 Android scholarships via Udacity and in partnership with Bertelsmann for EU mobile developers. Computer Science First—a free program focused on increasing 9-14 yo students’ exposure to computer science education, through after-school and in-school programs led by teachers. We’ll also be deepening our partnership with national, regional and local governments, as well as private sector businesses, to expand our national training programs beyond the EU. My hope is that, a year from now, tens of thousands more Europeans will be able to share similar stories to Carlo’s. There’s so much more to do, and we’re here to help.